Plain original cheesecake is a delicious dessert, but it can be so . . . plain. Christmas was around the corner, and I wanted a cheesecake imbued with a bit more character: a warm, seasonal touch. I checked in with a friend who might know a thing or two, and one delicious afternoon later I was on my way to the answer. Eggnog cheesecake is a flavor party: gingersnap crust, nutmeg cheesecake, pomegranate glaze. My friend and fellow kitchen enthusiast had discovered a winning cheesecake variation via The Naptime Chef, and served it up. Cheesecake's plainness serves as an unbiased canvas for other flavors; In this case, a hint of nutmeg, brandy and cognac (or you can use rum), a gingersnap crust, and a pomegranate glaze did wonders. I share my own modified version of the recipe later in this post. ...and you'll still have batter left over. I poured the extra into ramekins. Not only was my friend's cheesecake beautiful, it tasted amazing. I wanted to share the recipe with everyone immediately. I also considered engraving the recipe into a brass plaque entitled "Perfection" - but after finishing the slice, crushing contentment prevented me from accomplishing anything for several hours. Le sigh. Seeding a pomegranate is a gory undertaking! But you need to for the pomegranate cheesecake glaze. While the Naptime Chef calls it an "Eggnog Cheesecake," it thankfully doesn't use eggnog, and doesn't taste too much like eggnog (eggnog is delicious as a drink, but to eat?). Instead, it tastes like the warm winter flavors of nutmeg and ginger. 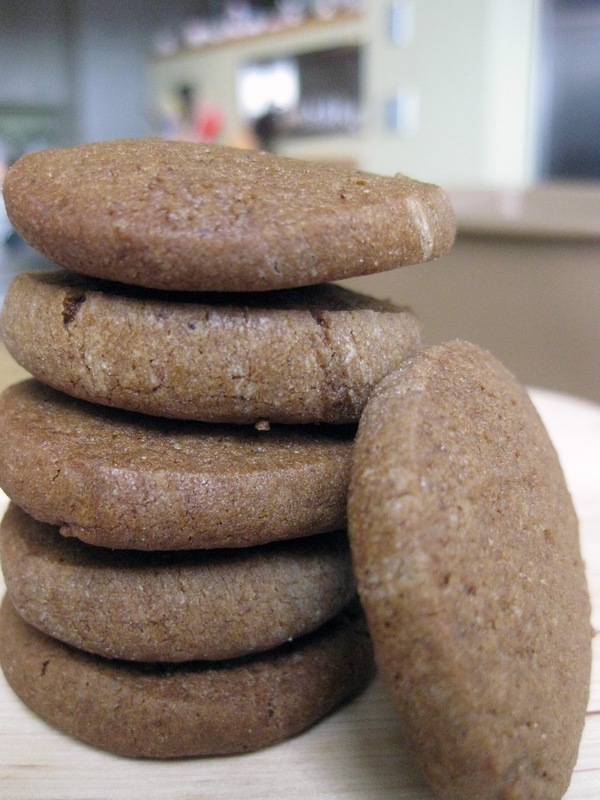 I made gingersnaps, just so I could crush them up for the gingersnap crust. The slightest suggestion of warm nutmeg - a refreshing contrast to the chill of the cold dessert - and a comforting, buttery gingersnap crust make for a great winter dessert. The glaze provides a satisfying crunch every time you hit a pomegranate seed. And the rum and Cognac...well, why not? The eggnog cheesecake was so smooth on top! Perfect....and very tender and silky inside. The Naptime Chef recipe is missing a few items (vanilla, oven temperature for the cheesecake, my helpful reflections), so I've reposted my adaptation of it here. See below for the recipe. A plain cheesecake is pretty special. But so is this. I hope you enjoy one of my new all-time favorites! NOTE: Requires a 9-in springform pan, which you should fill about 2/3 to 3/4 full. There might still be extra batter, so it can be useful to have a few ramekins or a mini cupcake pan on hand. 1. Preheat the oven to 400 F.
2. Crust: Melt butter and combine it with the gingersnap crumbs and brown sugar in a large bowl until moistened evenly. Press into the bottom of a springform pan and bake for 10 minutes or until toasted. Set aside to cool, and turn oven down to 350 F.
3. Cheesecake: In an electric mixer fitted with a paddle attachment, blend cream cheese, butter and sour cream together until completely smooth, scraping down sides as needed. (The recipe calls for the paddle attachment. I used the whisk/beater attachment, which may have contributed to the extra volume and nice texture of the cake I made. It's your choice. I plan to keep doing it my way.). If there are still lumps, put the bowl into the microwave and heat it very briefly to melt everything a bit, and mix again until smooth. Next, add cornstarch, sugar, vanilla, rum, cognac/brandy and nutmeg. Beat on high speed until well blended. With the mixer on low, beat in eggs one at a time. 4. Pour the batter on top of the cooled crust. Then, wrap the pan very tightly with aluminum foil so that it can be placed in a hot water bath. Fill a baking or roasting pan with water until it is halfway up the side of the springform pan. Bake cheesecake for 70 - 80 minutes at 350F, or until the top is light brown and the cheesecake is mostly set. I found that it took 80 minutes or more, and never seemed fully set. However, even if the center is still jiggling, as long as the other criteria are met, just remove it from the oven. Let cool at room temperature for at least 30 minutes, and then refrigerate, and everything should be fine. It is ready to serve once completely cooled, which requires 3 or more hours of refrigeration. 5. 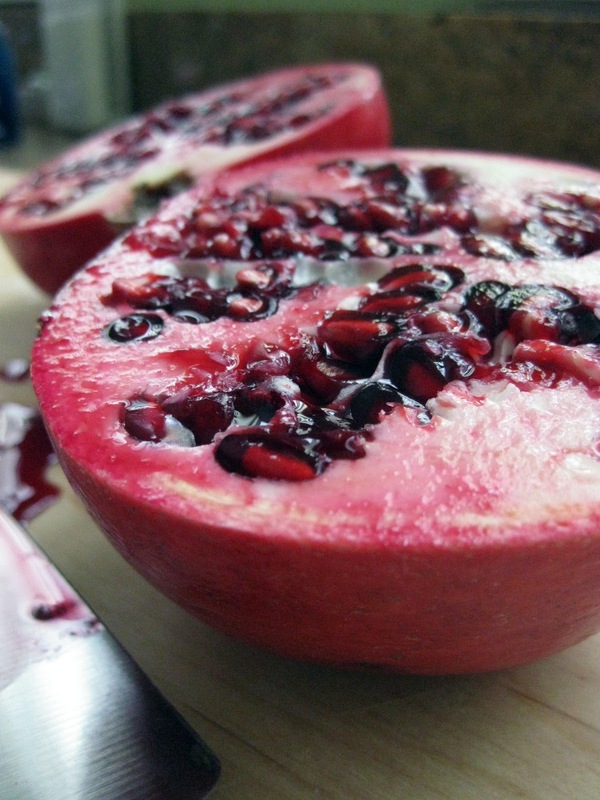 Glaze: Add sugar, cornstarch, pomegranate seeds and pomegranate juice to a small saucepan. Simmer until the liquid is reduced by half and thickens. Allow to cool before pouring over cooled cheesecake.